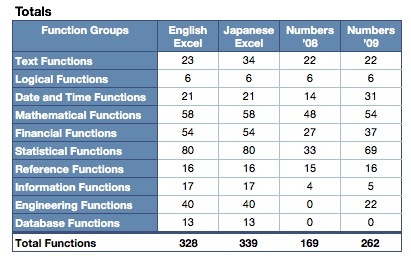 Back in late 2007 I wrote an article comparing Excel functions with Apple’s Numbers ’08 – Apple’s then new spreadsheet application that was part of iWork ’08. This week Apple released iWork ’09, which contains Numbers ’09. For completeness I thought I should do the same comparison again, to see how Numbers now stacks up. Here is a link to the spreadsheet in Numbers ’09 format (zipped), and a PDF Version. As you can see, things have improved a lot in terms of coverage of Excel functionality. In particular, there are big increases in Statistics and Engineering functions. Almost 100 new functions were added in the new release. What does that mean for those coming from Excel, or trying to import Excel spreadsheets? Well, Apple seem to have covered most of the common functionality. The numbers above are misleading, and look like Apple haven’t – but when you take, as an example, Engineering functions, you find that most of the missing functionality is around complex numbers. I doubt anyone reading this blog has a spreadsheet that does complex number calculations. Similarly database functions – their use is pretty obscure. There are possibly some stats and finance functions that will break Excel import, so if you rely heavily on these you should check the list. So is Numbers any good? Yes. I use it daily, and it is much easier to use than Excel, the results look better, and it has some great functionality such as table categories and intelligent tables – in comparison Excel is just a big boring grid with some functions behind cells. Being able to put small individual tables on a single page is the real advantage of Numbers, and the end results are spreadsheets that actually look great, communicate better and are easier to manipulate. Numbers is a pleasure to use for the most part. You can export to Excel format, though it is always disappointing as Excel spreadsheets are so damn ugly. The iPhone also can view Numbers documents (as it can Excel). If you are on Windows of course, you can’t view Numbers documents. But who actually chooses to use Windows these days?! First of all, I think Numbers is great and I use it much of the time. But I wonder if they improved the performance of the Lookup functions? I have a few spreadsheets that make extensive use of lookups between tables in order to calculate various values, and while they work very nicely in Excel, they are DOG SLOW in Numbers ’08. Any word on whether they have optimized performance in ’09? Hey Lowell, I’d be interested in knowing about this too. You know you can download a free trial copy of iWork ’09 from Apple’s website. It’s fully functional, and doesn’t wipe out iWork ’08. Maybe you could try your spreadsheets and report back here?